Gov. 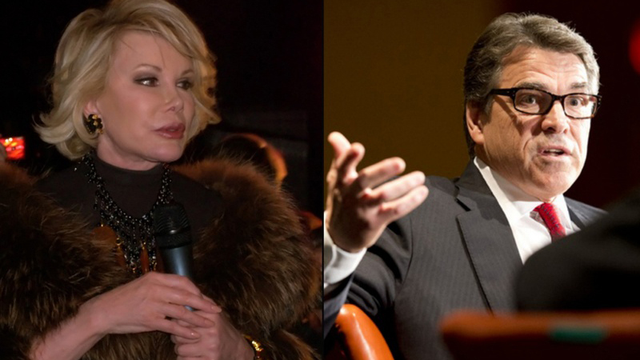 Rick Perry drew media attentionaround the world Sunday when he suggested comedian Joan Rivers might not have died had a measure similar to one that implemented new regulations on Texas abortion clinics been put into place in New York. Yet Perry, whose office declined to clarify his remark, wasn’t the first to make a link between the circumstances surrounding Rivers’ death and House Bill 2. Several conservative writers had argued that the medical complications that emerged before Rivers' death serve as a reminder of the importance of doctors at clinics — including abortion clinics — having admitting privileges at local hospitals. One of the requirements of House Bill 2, which Perry signed into law in 2013, is that doctors performing abortions must have admitting privileges at a hospital within 30 miles. A legal challenge over the law is currently winding its way through the federal court system. Rivers died at the age of 81 on Sept. 4 at a hospital, a week after she visited a New York clinic called Yorkville Endoscopy for a minor procedure on her vocal cords and went into cardiac arrest. New York officials are investigating whether the clinic is at fault. Perry brought up Rivers during an event at The Texas Tribune Festival, in which a member of the audience asked Perry about House Bill 2, which also requires abortion clinics to adhere to the standards of ambulatory surgical centers, such as meeting minimum sizes for rooms and doorways and having pipelines for anesthesia. The enforcement of those requirements has led to the shuttering of dozens of abortion clinics around the state. Perry’s comment on the incident was widely viewed as puzzling for two reasons: Rivers’ procedure was conducted in an ambulatory surgical center, which is the standard of care HB 2 imposes on abortion clinics, and Yorkville Endoscopy does not perform abortions. Perry might have been referring to the admitting privileges part of the Texas law. But the doctor who performed the procedure on Rivers had admitting privileges at Mount Sinai Hospital, which is where Rivers was admitted after complications emerged. Conservatives saw Snyderman’s quote as proof of the reasonableness of the admitting privileges requirement in HB 2. Critics of the law have said that provision will contribute to large portions of the state not having any abortion clinics because no hospitals in those areas are willing to offer such privileges to the doctors working at area clinics. Perry's remark on Sunday drew criticism from proponents of abortion access who suggested that Perry didn’t properly understand a key aspect of the controversial legislation he had signed. “This attempt at distraction shows how ridiculous Perry’s supposed logic is when it comes to women’s health,” Planned Parenthood Texas Votes Communications Director Tanene Allison said Monday. Surprisingly, Perry was not the only lawmaker to connect Texas abortion regulations and Rivers’ death over the weekend. A day earlier, also at The Texas Tribune Festival, state Rep.Dawnna Dukes, D-Austin, brought up Rivers during a women’s health panel. Dukes pointed to the circumstances around Rivers’ death to buttress her argument that supporters of HB 2 were more interested in restricting access to abortions than improving the overall safety of medical care for women.